Finally saw a few white butterflies today... and with the butterflies came a few tarpon to check out the warmer dark brackish water of the peace. Saw 4 or 5 that went 120+ today... nice and dark from the stained waters. They weren't having any of what I had to offer though... so I had to settle for a couple juniors today. Both caught on small jigs. Looks like one more cold front this week and then we should be home free for the summer. Bring on the migration!!! Oh and I caught 4 of the biggest jacks I've ever seen on this coast. Big enough that they were pulling drag enough that I was hoping they were 50-60 pound tarpon... ahh but the headshake. Thank you for the report! Sounds like a good day. Any pics of the Jacks...how many inches and pounds were they? No pics of the jacks, although it did cross my mind. They were over 12-15 pounds on the boga grips but seemed heavier to me. They ate 10" mullet lol. Dark tarpon suggests they were local, non-migrating adults that never left over the winter. The ones that come in from the gulf tend to me much lighter when they arrive....or at least that's been my theory based on observing them early in the season up here in TB. Jacks are amazing fighters, saw some big ones swim by, I would love to catch one over 3 ft long, even 4ft, I hear is possible....is that true? I've never seen one 3' long... maybe an Amberjack... but not a jack cravalle. Water temp started at 69 and rose to 75 before I left. I've personally never seen a tarpon back there that looked like the ocean-side tarpon do... they always have a dark back and a golden hue. Even the ones out in the harbor closer to the blue water of Boca Grande always seem to have that dark back (from what I've seen anyway). I'll pay more attention to it this year to see if there's a point where they seem to take on the colors of the brackish water fish more. 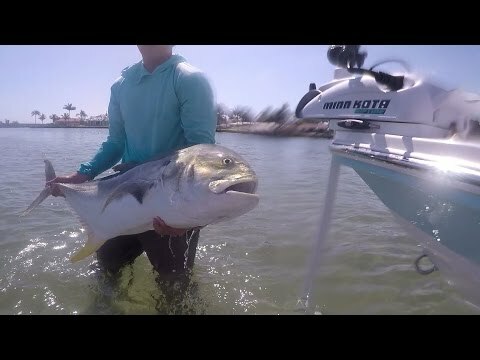 I have not seen them that big either Kmag but Crevalle Jacks definitely get to be that big. I have never seen one on the west coast of Florida but check out this young guy who fishes on the east coast. I think Ft. Lauderdale or Miami area. Fast forward to the 10 min mark. The jack he catches is definitely 3 ft+ and who knows how heavy. He catches a lot of those giant jacks in his videos. Very cool. Usually eat big mullet off seawalls and such. That thing was a beast! My goodness. No doubt! I'd love to catch one of those. I've personally never seen a tarpon back there that looked like the ocean-side tarpon do... they always have a dark back and a golden hue. They don't stay light long. We only see them that color way up the in the bay when they first get there. A week later they are dark. On that big jack, it is cool video, but personally I think after long fight, you should not have it out of water too long....I know there are editing clips, but I think you need to get it back in quickly, not trying to start a troll war....do bigger fish last longer out of water? I agree wadefisherman... I'm always erring on the side of caution with fish, big or small. One reason I hardly take pictures is to give the fish a better chance at survival after the release. Get a quick shot and back ya go. Mike, from an evolutionary standpoint, and I mean millions of years, how would fish have built the adaptation after exhausting all their energy, to not get oxygen for a few minutes. I can think of a predatory situation...maybe when they get chased on shore and that is why they flop around so emphatically, and possibly from being caught by birds, etc....ok never mind I can see how it is possible. All I can tell you is that I've had jacks flop around my boat, in my livewell, use them as bait, and beat the crap out of them and they swim away just fine. They are just tough fish. Not like a tarpon that can just keel over and die after a fight. Not like a trout that can often do the same. Not like a threadfin that's dead after two casts. I'd think of them more like a pinfish -- jacks are just tough fish.